There is nothing like jumping on your motorcycle and going on a long distance ride. Feeling the wind, exploring new scenic rides, and not having to worry too much about your gas tank – it’s an exhilarating experience. It’s easy to forget while planning your weekend adventure that motorcycling is physically demanding. Sitting on your bike for hours on end can take a toll on you, mentally and physically. Motorcycle safety should be your top priority, so if you get that rush of sudden spontaneity, pause and remember to plan. Never jump on your bike without properly packing. Whether you’re riding to the next town, or setting out on a cross-country motorcycle trip, you should always have a tool kit on hand. Your tool kit should consist of motorcycle repair essentials, a first-aid kit, emergency money and a fully charged cellphone. Be mindful of how you pack your bags. Try your best to evenly distribute the weight on your bike to avoid getting thrown off balance by a gust of wind, or bump in the road. Do you ride your motorcycle everyday or at least for a few hours every week? If the answer is no, make sure you remember to take breaks every few hours. Your body might not be used to sitting on a bike for long periods of time, and it can start to ware on your muscles after a while. Adjust your bike and wear comfortable yet protective gear. 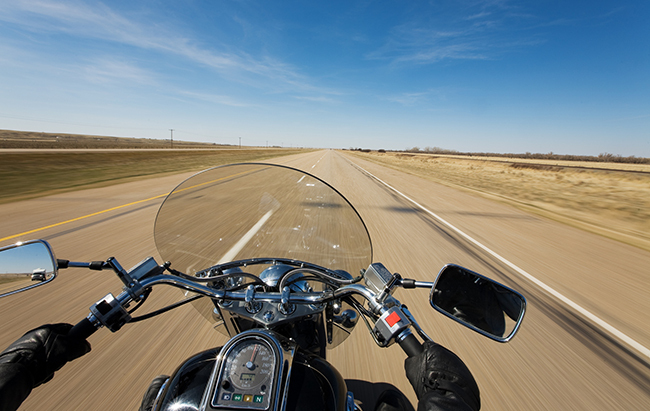 Before setting off on your journey, perform a motorcycle safety inspection. Map your ride and have an idea of places that you want to stop along the way. Locate major cities on your route where you’ll be able to pick up supplies if necessary, refuel and rest. Never ride when you’re tired. Sometimes it can be hard to get a proper night’s sleep while out on a multiday ride. If you’re not in a time crunch, don’t set an alarm – let your body rest. Exhaustion can sneak up on you, so make a habit of taking breaks to stretch and walk before you feel drowsy. Keep in mind that exposing yourself to wind and sun for long periods of time dehydrates you so drink plenty of water. It’s A Fine Line is an inclusive community of motorcycle riders advocating one common mission: zero motorcycle deaths by 2030. We want to share videos and stories about motorcycle events, rides, clubs, gear, safety and training because we believe that together we can save the lives of our friends, our families and our communities. Excellent. I wish to pass this along to my bikerfriends. I wish everyone read this. its a great reminder.